Today we will look at the Spirit of 76 painting that hangs in City Hall. The painting, depicts a flag bearer, drummer boy, and fifer marching across a battlefield during the American Revolution. The oil painting was created by Archibald Willard and measures 8′ x 10′. Willard was born in Bedford, Ohio in 1836 and lived in Wellington, Ohio (both in the Cleveland area). He served in the Ohio Volunteer Infantry in the Civil War. He painted the Spirit of 76 for the 1876 U.S. Centennial Exhibition in Philadelphia. It was originally entitled Yankee Doodle. The painting became very popular and he painted at least 14 “original” copies of it. Two of those originals are still in Cleveland today. 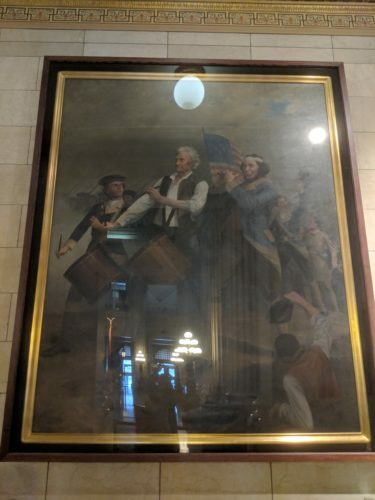 One is that the Western Reserve Historical Society and the other commissioned in 1912 by then Mayor Newton D. Baker, hangs on the north wall of the Rotunda inside Cleveland City Hall.